The Geekvape Aegis Mini has finally arrived! Vaporider already has a great deal going too. 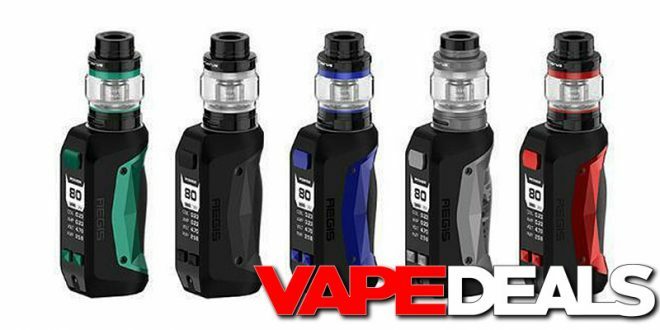 They’re selling the full Starter Kit (includes Cerberus Tank and coils) for $46.95. But…you can knock $5 off that price when you apply coupon code “aegis5” at checkout ($41.95 total). Seems like a great deal for one of the toughest mods on the market (my original Aegis is still going strong!). Take your pick from 5 different colorways: Black Green, Stealth Black, Black Blue, Camo Gunmetal, and Black Red. This offer expires Friday (11/9) at midnight, so don’t wait too long to stop by. And, as always, keep in mind that shipping is FREE when you spend $75 or more.